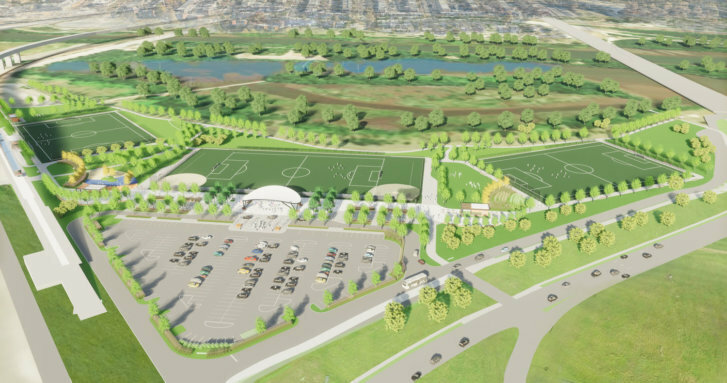 The first stage of RFK's redevelopment officially broke ground Wednesday, with 27 acres of athletic fields planned to be in place by next spring. See renderings of what's coming up. WASHINGTON — On the kind of sweltering day that might have greeted a dog-days-of-summer Nats game or playoff chase D.C. United match in years past, the first thing to go was the free towels. That was just fine with Events DC, not just for the free branding, but because the fact that anyone was gathered in RFK’s Lot 7 to begin with meant that a long-discussed, much debated, comprehensive reimagining of the massive athletic campus on the bank of the Anacostia was at last becoming a reality. With shovels in a sandbox atop the sun-soaked sprawl of concrete, the crumbling stadium behind, city leaders and officials broke ground on the first stage of RFK’s four-year, $489.6 million planned redevelopment Wednesday morning. That initial stage will transform 27 acres of asphalt on the 190-acre campus into a trio of multipurpose fields on the north end of the stadium that will accommodate soccer, lacrosse, baseball and softball, as well as a 6,000-square-foot pavilion in the middle. There will also be a visitor’s building, restrooms, and a storage and maintenance facility. The fields have a planned completion date of March 2019. The four other components – a market hall, a sports and recreation complex, bridges connecting through Kingman and Heritage Islands, and a permanent RFK memorial – have target completion dates over the next several years through 2021. But the focus on completing the fields first was paramount for all involved. Repurposing much of the existing concrete into usable space — especially green space — was a primary focus in this initial project as well. The RFK efforts are part of a larger push by Bowser and the city to gain control over the many acres of federal land within District limits. That includes small parcels such as Franklin Park in downtown Washington, as well as the city’s three golf courses. 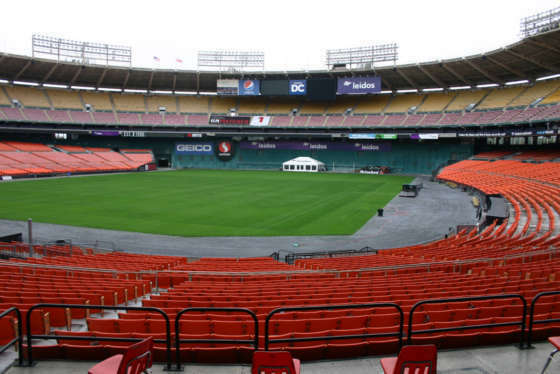 Come Oct. 22, D.C. United will play its last home game in Robert F. Kennedy Memorial Stadium — RFK as it’s more simply known — leaving the historic D.C. stadium without a professional sports team for the first time since the gates opened in 1961. See photos of all the sports and entertainment history made at RFK Stadium. Naturally, any discussion of the RFK campus led into questions about whether there would be an effort to draw the NFL back inside the city limits, especially with Washington now home to MLB, MLS, the NBA and the NHL. While questions were asked about the team’s name holding up any relocation — Ward 7 Council member Vincent Gray referred to them as “our Washington Football Team” — Mayor Bowser focused solely on the land issues. “I think that this is really the only space in the region that makes sense for the team, and for us, nothing happens without control of the land – that’s why it’s had our attention for the last three and a half years,” she said after the event. However, she went from RFK to the 57th Annual Welcome Home Luncheon, which moved from National Harbor to the Marriott Marquis this year, where she sat at the head table with team owner Dan Snyder. Any long term discussion of the RFK space as a football home is independent of the short-term programming that will occupy the next several years.